The sunshine looks really nice ! Plants are on autopilot. LITFA has been the theme for this grow so far. I pull them out of the greenhouse every day for sunlight, poke at their soil, give them a bit to drink every once in awhile and feed them on Wednesdays. So far, easy peasy. 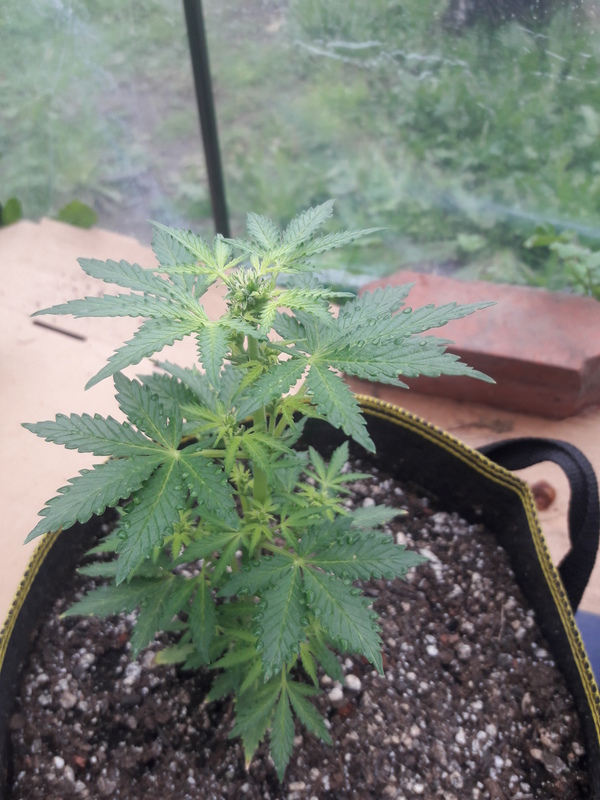 First DD above looks healthy, second is the non productive leaf crinkle mutant, I usually pull them and advise others the same. 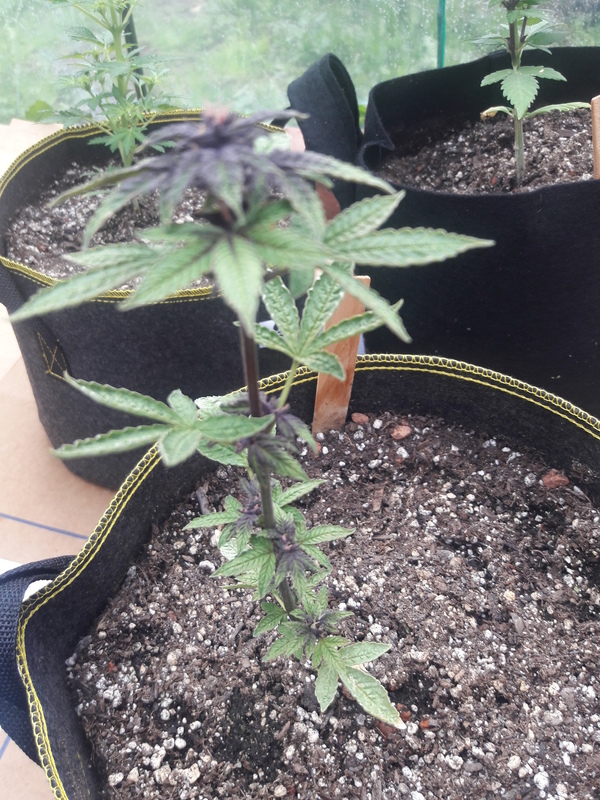 As for autos in general they do really well so long as they start well, cause if they get held back or have issues early on then by the time they switch over to flower mode they don't have much of a root system to go off of. Would have been more helpful about a month ago @Mr.Sparkle lol... but thanks for letting me know! Well folks, you heard the man...that concludes the experiment portion of this grow... I'm gonna just continue on and feed all of them Mammoth P, since my experimental plant is a "leaf crinkle mutant" per Mr. Sparkle. Gonna finish growing it anyway, been this long... I will attempt another Mammoth P comparison directly in the veggie patch in a week or two. Just did a little stem rub... The dark devils have a spicy citrusy scent that smells so familiar to me, but I can't nail it down. @ReikoX fem mix is my fave so far smelling like black pepper. I love that smell, hope it stays like this. Both absolutely lovely in fragrance. Sparkle was right the mutant crinkle leaf is not really budding... it is but really scantily. Planted 2 more seedlings of each, I compacted the soil a bit more and planted the seeds deeper this time. Hoping no helmet head. I'm gonna transplant these in the veggie patch in a few weeks to see how the new soil amendments are working. I am not really a smelly-identifier type person but to me the Dark Devil of mine smelled like lavender or potpourri. .. spicy flowers. In all honesty, I enjoy these smells better than my beloved blue dream. Citrus isn't my favorite cannabis smell. I prefer more spicy scents like these. I normally get those aha moments a week or two later at some obscure moment. Yup! Suddenly you have to blurt it out and no one knows wtf you are talking about. @Heritagefarms are you talking about the crinkle leaf one? 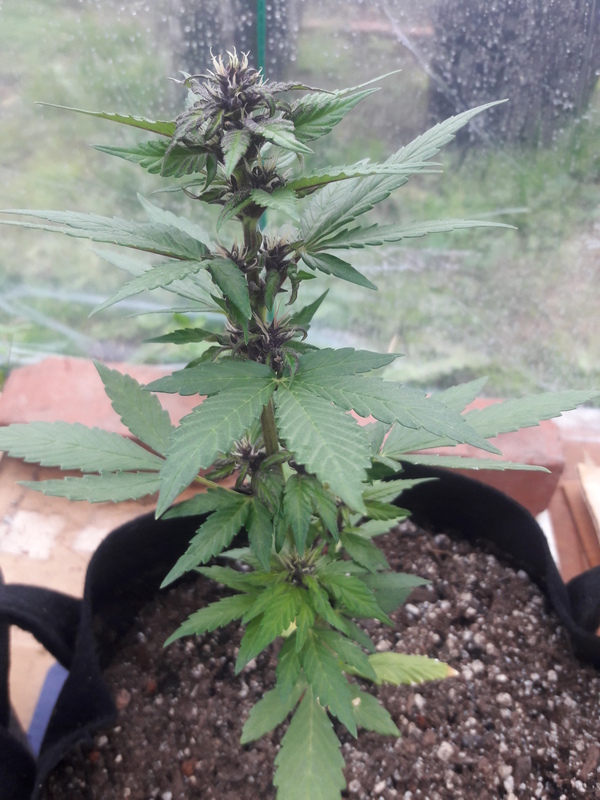 If so, Mr. Sparkle who made these auto seeds said it's a mutant. I'm also not too sure we have russet mites in Southern California. Yes I'm referring to the crinkle leaf one, there are varieties that display leaf curl during flower but the leaf color and the curl on the larger leaves looks alot like russet mites, I'm sorry to say you definetly have russet mites in so cal, one of the main suppliers of clones for most of california is spreading them like wild fire, I got mine from a zkittlez cutting I got from dark heart clones. I'd look real close and check out under a small microscope, the sooner you catch them the better. @Heritagefarms just scoped it through the loupe. I don't see a single thing on the leaves except trichomes. I had two of the crinkle leaf variety of the Dark Devil too, it was not russet mites in my case and verified with a microscope. I have no direct experience with russet or broad mites, but I've read multiple times that you need stronger magnification that that to see them. Having said that, I'm not convinced that what you are seeing are symptoms of mites. I would be more inclined to think it's the aforementioned mutation. I appreciate the info @Heritagefarms now I know what a plant with russet mites would look like if I ever do get them. I'll take an even longer look tmw in full sun just to be 100%. Pretty sure it's okay though as I have all sorts of different plants in the greenhouse and none of them have weird crinkle leaves like that although I suppose it could look different on another type of plant.